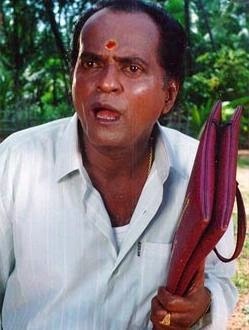 Kuthiravattam Pappu in a scene. One decade have gone past that Kuthiravattam Pappu has left us. Kozhikode's street still tell the stories of how Padmadalakshan became the 'Pappu' of Malayalam cinema. After that standing with his counterparts he never gloom in cinema field. His acting become big lessons for young generation stars and still reading in by books. hard on him as a beginner. His miserable life led him to stop his studies in the middle. Padmadalakshan still survive as he love art as his blood. Kozhikode's Raja Theatre and Akashvani's "Deshaposhini"(Radio Programme) witness the presence of Kuthiravattam Pappu among people. He cemented his place among big's of Malayalam drama's - Balan K.Nair, Kunjandi, Bhaskaran, Kunjava. After that Kuthiravatam Papu turns to drama writing, he jointly prepared "Kappayill Nin Cinemayileke" with his friend Venu, make way for cinema director Ramu Karyat, to watch his first drama. Ramu karyat thrilled with Pappu's skills offered him a role in his movie called "Mutupadam", that open the doors of opportunity for Kuthiravattam Pappu. On 1964's "Bhargavinilayam" set that, Bepoor Sultan Vaikom Muhammed Basheer named Padmadalakshan as "Kuthiravattam Pappu", that name birth his fate. He climb the success ladder quickly in Malayalam film fraternity. Kuthiravattam's Kozhikode style and his slang gave him a different identity and fans in the South Indian industry. His Up's and Down's witnessed by his wife - Padmini, and Children - Bindu, Biju, Binu and Son in Law - Gopikrishanan, He nurtured and pampered every character essayed in his career. He never misused his freedom for his style and acting. In 1977, Kuthiravattam Pappu bestowed with the Best Comedian Award. Director Ranjith was supposed to do the solo movie with Kuthiravatom Papu and actress Sukumari. But Kuthiravattam Pappu's death takes it all with him.With his 32 years long term with Malayalam cinema ends in his 62nd year of birth. He looms behind the Silver screen.